A backline will be drawn the appropriate distance from and parallel to the trig. Sidelines are defined by either drawn or imaginary lines from the edges of the trig to the backline. Both the backline and sidelines are considered to be in the 'fair' part of the throwing area. The competitor will complete the throw under control as decided by the judge or the throw will be ruled a foul. A throw exceeding beyond 45 degrees from the front of the trig shall be considered a foul as it does not represent the implement was released under control. 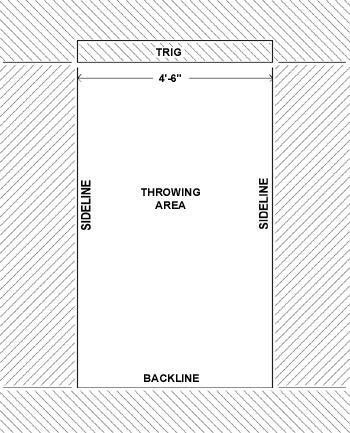 The throwing area should be outlined beforehand to determine if a throw is legitimate. After the throw has been executed, the athlete must leave the throwing area under control. Each competitor will be allowed three throws in the competition, the farthest of which will count for that event. The competitor may stop during the throw and re-start the throw as long as no foul has occurred. The competitor may even leave the throwing area before re-starting if allowed by the judge. Each throw will be measured from a point on the inside-upper edge of the trig closest to where the competitor's plant foot (left foot for a right-handed competitor) landed to the nearest break in the ground made by the implement (not including the handle). Ties will be broken by comparing the next farthest throw for each competitor involved in the tie. The competitor with the farthest of these throws will place highest. If other ties occur, then this process will repeat for all attempts taken. A throw will be a foul if the competitor touches the ground as defined in Figure 1 or any surface of the trig other than the edge facing the throwing area. One of the competitor's feet must always remain in the throwing area either on the ground or in space directly above the throwing area. When both feet touch or are over the sideline at any point in the throw it shall be considered a foul. * Men – 16 lbs. to 22 lbs. * Women – 8 lbs. to 12 lbs. There is no standard size or weight of the stone. The stone must be put with one hand and with the stone remaining against the neck throughout the throw until the release. Any throwing style may be used as long as the rules are followed and the style is deemed safe by the judge. The backline will be drawn 7'-6" from the trig. * Men – 20 lbs. to 26 lbs. * Women – 13 lbs. to 18 lbs. The same rules apply in the Braemar Stone Put as in the Open Stone Put except there is no approach allowed. The stone must be put from a standing position. Reversing the feet after the release is allowed. * Women – 12 lbs. to 16 lbs. The hammer head shall be spherical and made of metal, and the shaft shall be of wood, rattan, bamboo, or plastic (PVC pipe is sometimes used for increased durability). Rattan or bamboo is recommended over wood or plastic. The total weight of each hammer will be 12 lbs., 16 lbs., and 22 lbs. The women shall throw the 12 lb. and 16 lb. hammers and the men shall throw the 16 lb. and 22 lb. hammers. The length of the hammer will be no longer than 50" in overall length. The hammer will be thrown with the feet in a fixed position. There is no approach allowed in the hammer throw. The competitor may move his feet after the hammer is released. No back line is drawn for the Hammer Throw and sidelined are normally not drawn either. All fouls besides the backline foul still apply. There is no standard size or weight of a caber but the caber should be of a length and weight such that at least half the competitors can turn it. The caber is to be made only of wood. The caber shall be placed upright for the competitor, with the heavy end on top. The attempt begins when the competitor lifts the caber from the ground. If the competitor drops the small end of the caber back to the ground after having picked it up, this shall count as one attempt. It is recommended that a back judge and a side judge be used. The judge may set boundaries if he feels the ground in a certain area is not suitable for the caber to be tossed or to provide safety for the spectators. The competitor may take any length of run they wish and may toss the caber from where they choose, as long as it is within the judge's boundaries. The caber must pass through the vertical position (90 degrees from the ground) in order to count as a turned caber. It is up to the side judge to determine if the caber has passed through it. The "clock face method" of judging shall be used. The caber in a perfect toss will pass through the vertical position and land with the small end pointing directly at 12 o'clock away from the competitor in an imaginary straight line extending from the competitor through the initial landing point and in line with the direction of the run. An overhead view is drawn in Figure 2 below to demonstrate a 12 o'clock toss. A valid throw is when the small end of the caber passes through the vertical position (90 degrees) and falls away from the competitor to land within the 180 degree radius between 9 o'clock and 3 o'clock. An overhead view is drawn below in Figure 3 to demonstrate some turned cabers and how to score them. If the caber lands in a 12 o'clock position pointing away from the competitor but not in a direct line with their run (as when a competitor turns to one side at the last step or two), then the judge must determine the competitor's direction of run and then look through the competitor to the small end of the caber, thus giving a true reading of its relation to the direction of run. The direction of run is determined by the direction in which the competitor runs after having control of the caber. An overhead view is drawn below in Figure 4 to demonstrate a toss such as this. Once the competitor has started on his run, the judge should pick a point in the horizon to use as a reference point once the toss has been made. The competitor may run in one direction and then stop and change directions as long as they show control over the caber. The caber shall be judged on its landing position, not the position to which it may bounce or roll. If the caber is not turned by the competitor, then it is the responsibility of the side judge to determine the angle at which the caber was tossed with respect to the 90 degree vertical. The side judge should be perpendicular to the competitor's direction of run in order to make an accurate call. A drawing of a view from the side judge's position is shown below in Figure 5. Figure 5. Measuring the Angle of a throw. Each competitor is allowed three attempts, all of which should be scored and the best of these to be used to determine placing. In the event of a tie then the next best attempt or attempts shall be used to determine placing. The order of placing shall be determined by the nearest to 12 o'clock toss made by a competitor. If the competitor did not turn the caber, then placing shall be determined by the toss closest to the 90 degree vertical. If after one complete round the caber has not been turned by any competitor and the judge agrees, the caber may be cut. The caber shall be cut from the large end and the amount is to be determined by the judge. This process can be repeated until the caber has been turned. When a qualifying caber is used then any successful turn qualifies the competitor for the next caber. Ties are broken by comparing the next best attempt for each competitor involved in the tie. The competitor with the next best score places highest. If other ties occur, this process is repeated for all previous attempts. Each competitor will be allowed three attempts at each height. Each competitor may enter the event at any height in the competition. A competitor may pass any height they choose, but each height attempted must be cleared before attempting the next height. If a competitor has passed a height it is not considered a miss or a make and will not count for or against the competitor. When a competitor has missed three attempts at one height then he will be eliminated from the competition. A competitor will not pass individual attempts without also leaving the competition. All measurements will be made from the ground to the top of the crossbar. The starting height will be agreed upon by the competitors and the judge with the judge having the final decision. The bar may be raised by larger increments until most of the competitors are eliminated and then raised by a lesser amount requested by the competitors and agreed to by the judge. The crossbar may be suspended at both ends or by one end. It may be suspended at both ends by either pulleys and rope attached or rested on pegs attached to the uprights or both. If the implement pulls down the crossbar as it goes over, it is the judge's decision whether the toss will be counted or not. If the crossbar is suspended by resting on pegs ("touch-bar"), then the toss will not be counted if the crossbar is knocked off either peg. The crossbar will remain on the pegs after an attempt until the competitor leaves the throwing area (determined by the judge's discretion). The crossbar will be 10'-0" in length or shorter. The center of the implement will go over the bar within the inside of the uprights or the inside of the upright and the end of the bar if only one upright is used. The implement may touch the crossbar as it goes over. Ties will be broken by comparing the number of misses at the last height cleared. The competitor with the least amount of misses at that height will place highest. If this number of misses are equal, then the next highest height is then compared and the competitor with the least amount of misses at that height will place highest. If other ties occur, then this process is repeated for each previous height until all places are determined. * Men – 16 lbs. to 20 lbs. * Women – 12 lbs. The sheaf will be a burlap or plastic bag filled with a suitable material such as straw, mulch, or rope. The sheaf will be thrown over a crossbar for height with a pitchfork. The total weight of the bag shall be 20 lbs. for men and 12 lbs. for women. If there is a master's class they may throw a 16 lb. sheaf instead of a 20 lb. weight. The toss shall be made in any manner desired using a pitchfork with at least two tines. * Men – 56 lbs. * Women – 28 lbs. * Masters / Juniors – 42lbs. The weight will be thrown with one hand only. The weight shall be made of metal but can be of various shapes and sizes including spherical, bullet or box shaped. The handle can either be attached directly to the weight or attached with a length chain. The handle may also be of various shapes and thickness such as a ring, triangle or a "D" shape. The total weight of each implement shall be 28 lb., 42 lbs. and 56 lbs. The women shall throw a 28 lb. weight and the men shall throw a 56 lb. weight. If there is a master's class they may throw a 42 lb. weight instead of a 56 lb. weight. The implement shall not measure more than 18" in overall length but a weight shorter than this is normally used when thrown for height to avoid hitting the ground when swung between the legs. Any throwing style may be used as long as the rules are followed and the style is deemed safe by the judge. The spinning Weight over Bar is not recognized as a scored event in Canada. A fixed bar may be substituted for a knockoff bar and may be counted in overall rankings. A Scottish Heavy Events competition is defined by at least five of the events listed above. If only five events are used, then no two events will be similar (such as two stones, two weight throws for distance, or two hammers). If an implement breaks during a competition and cannot be repaired quickly, the round in which it broke should be started over with a new implement being used. If the judge determines that time does not allow for this, then a new implement will be used and the round continued where it left off. In the interest of safety, the judge has the right to disqualify any competitors who in their opinion do not have the ability to complete a throw without injuring themselves, other competitors or spectators. The judge also has the right to disqualify any competitors who display poor sportsmanship. All competitors competing will wear a kilt during the competition. The judge may apply a time limit to each throw if he feels it is necessary. If the competitor does not begin the throw within this time limit the attempt will be a foul. In the event of a tie after any of the above tie-breaking methods have been applied, the points for the places in question will be added together and divided evenly among the tied competitors. The trig is to be made of wood. The trig will be 4'-6" long, 6" tall, and 6" wide. Every effort shall be made to secure the trig to the ground so that it will not move during the event if a competitor steps against it. The winner of the event may take three extra throws to try to break a record, whether it be a Games Record, North American Record, or World Record. Extra throws taken for records will not count for points in the decathlon scoring system. Individual fingers or the thumb of the throwing hand may be taped but the fingers or thumb will not be taped together. No straps or other devices besides a glove will be used to aid the competitor in holding the implement. No footwear that may aid in increasing the athlete's height will be used in the events thrown for height. In order for a competitor to win or place in an overall competition, they must attempt to compete in all of the events. At the discretion of the judge, if the competitor does not attempt to compete in all the events then they will not receive points or awards for the individual events or the overall competition. The points for an event are usually awarded in one of three ways: one point method with least points wins, one point method with most points wins, and the decathlon scoring systems. The one point scoring system is recommended. The decathlon scoring system uses either the best throw of an event at that competition or the World Record for that event as 1000 points. All throws are awarded points based on this distance or height. For example: if the best throw in the stone put is 50'-0", then this is worth 1000 points, if another competitor throws 45'-0" then this throw is worth 45/50*1000=900 points. To determine the overall champion the total amount of points accumulated throughout the competition will be added together and the competitor with the most or fewest points, whichever the case, will be declared the winner. If there is a tie for first place overall then the winner will be the competitor with the most first places in the individual events. If this does not produce a winner then the competitors will remain tied. All other overall places besides first will remain a tie. Measurements shall be recorded after rounding the measurement down to the nearest 1/4" in all of the events. After each completed event, the competitor who threw first is now placed last in the next event and all other competitors move up one place. This is repeated after every event. Safety must be a paramount concern to all the organizers, judges, competitors, helpers, and spectators present at the competition. Precautions should be taken to protect these people. The throwing area should be roped off to keep spectators off the athletic field. There should be some type of cage or backstop for the hammer throw. The order of events is recommended to be as follows: Stone Put(s), Weight Throw(s) for Distance, Hammer Throw(s), Caber Toss, Sheaf Toss and Weight for Height. If the competition is spread over two days, the events should be arranged so that there are equal heavy and light implements thrown on each day. If the judge has a doubt about calling a foul on a competitor then no foul should be called. Canadian records must be set by a competitor with Canadian citizenship and may be set anywhere in the world where Internationally recognized rules are used. When a Canadian record is thrown, the implement is measured on the field before any further throws are preformed. The weight is sequestered per international standards (government electronic certified scale). Then the record and all results are posted on the website by the A.D. of the games, or a CSAF representative. The provincial representative of CSAF will follow up with the A.D. to verify the implements legitimacy. The provincial rep. then declares it a Canadian record and posts it on the CSAF website. Starting 2018, CSAF is implementing a form submission for CSAF records. Click Here to download the form, fill it out and email it with weight verification photos to csafruss@gmail.com for ratification and addition to the CSAF website. 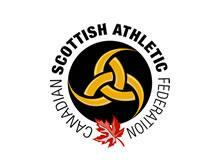 The Canadian Scottish Athletic Federation will endorse the Scottish Games Association (SGA) rules of a 2 year suspension for any athlete who violates the World Anti-doping Agency standards (Olympic and CCES).